Just a nice night out at MetLife. But you and I know it’s bigger than that. Thursday morning, I left for work with no plans other than to finish a busy work week and enjoy a three-day weekend. 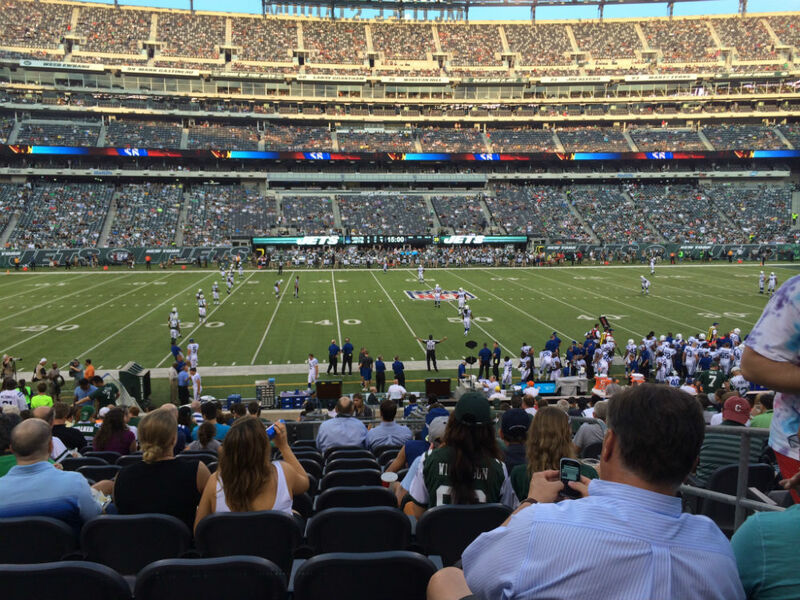 All that changed when my friend C. offered tickets to that evening’s New York Jets preseason opener. He was unable to use them, and wanted to know if Ryan and I would like to attend. It was late morning. Ryan was at camp until 4 p.m., so I couldn’t ask him. C. needed to know before then, and if we went, we needed to leave for the stadium by 6. In other words, this was going to be as spontaneous a trip as anything Ryan had ever done. And Ryan doesn’t really do spontaneous. At least, Ryan didn’t used to do spontaneous. 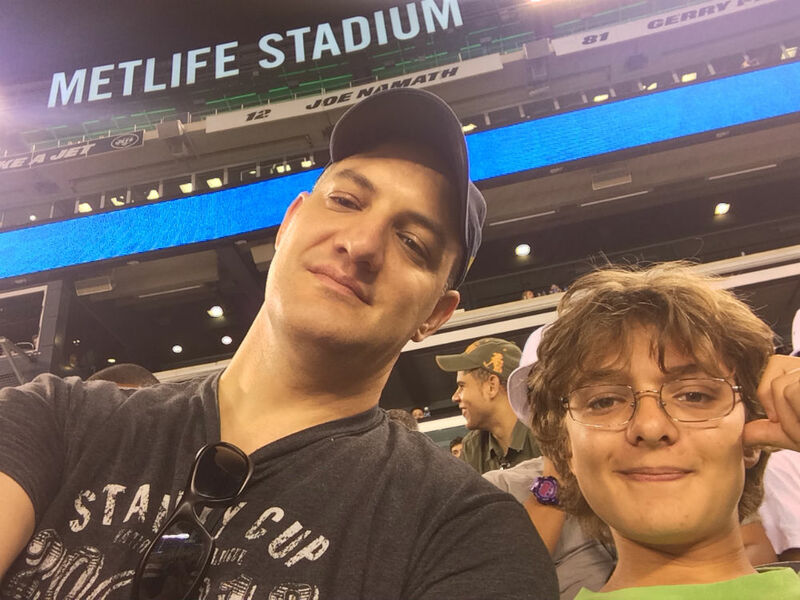 Last summer, we attended a Yankees game after making up our minds that morning. That outing set a new bar for spontaneity, and was cause for celebration. True to form, the next question was about logistics. “We’re going to leave at 6:15, right?” Ryan asked. He may have been up for a spur-of-the-moment trip, but he still needed the details. I explained that traffic might be a problem. I was due home at 6 and wanted to leave as soon as possible to give us the best chance to be in our seats for kickoff — something else that has been a major issue at past sporting events. I decided to risk telling him. It was as if I could hear the gears turning in his head as he hesitated for just a bit before replying. I got home, rushed to change quickly, and we were out the door. We hit traffic. He saw the arrival time on the GPS getting closer to kickoff. He kept bringing it up, asking if we were going to be late, before immediately dismissing it before I could respond. We talked about how long we might stay. He asked if we could leave early if he wanted, again, because it was just preseason. I have no doubt that if it was a regular-season game he wouldn’t even entertain such thoughts. I assured him it was up to him. We could stay as long as he liked. We pulled into the lot a couple of minutes before 7. We raced towards the stadium. 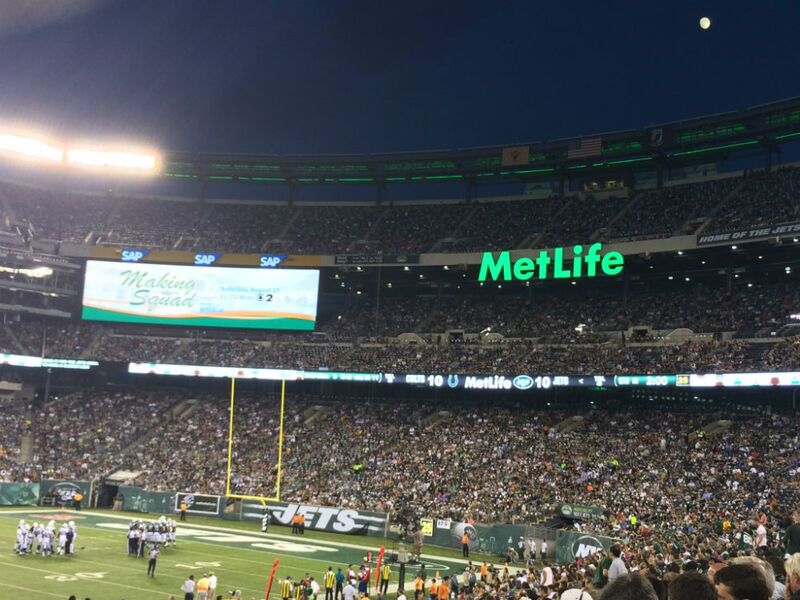 A large digital display outside MetLife Stadium was counting down the time until kickoff. There were still a few minutes left. I told him maybe. We still needed to get through security and find our seats. As it turned out, the gate we entered was right in front of our section, and we set down about 20 seconds before toe met leather to begin the game. As he always does, Ryan asked all sorts of questions. He displayed a deft recall of the earlier three Jets games we attended, which left me both pleasantly surprised, and not really the least bit surprised, if you know what I mean. He remembered some of the game’s subtleties that I taught him to look for at previous outings. He asked about the unique aspects of preseason — the frequent substitution, the experimental rules. The game was dull. Lots of penalties, punts, and snaps over the quarterbacks’ heads. It was a plodding 10-10 tie at halftime, played in front of a sparse, mostly lifeless crowd. It was your basic NFL preseason opener. Ryan was losing interest. At halftime, he asked about leaving early. I didn’t object. We watched a couple of second-half series before leaving late in the third quarter. Such an unremarkable outing, and such a big deal at the same time. Because you know and I know about Not Little Things, of which this surely qualified. Veronica brought it up in a text she sent me during the first half. I was thinking of your “Not little things” theme. Amazing how he so quickly adjusted his plans, got totally on board & was ready to go. So freaking great. Listening to sports-talk radio on Friday, I had to laugh about Jets fans grumbling about the so-so performance of their team. For me, it was anything but. Just a spontaneous evening at the game with my boy. Such a little thing and such a big thing at the same time. Like everything, and nothing at all. Thanks! It was a fun evening, made better by the knowledge that we probably couldn’t have done it in past years. I’m a sports fan, but not hockey or football, just motorsports and kinda basketball. I hope you have happy sports moments. My NASCAR favorites have given me happy times this year. One of my favorite drivers has 3 wins, the third was Saturday night and another favorite has been 2nd twice and led laps. One of my NASCAR favorites has MS, but has had no symptoms to speak of in a little over three years. He may have a mild kind, as he’s young. In an article or a comment on one at least, last year about his MS, a hockey goalie with MS was mentioned. I thought you might know about Josh Harding, since you’re a hockey fan. I wouldn’t know except for that article about that driver, Trevor Bayne having a mention of that goalie somewhere (article or comments).